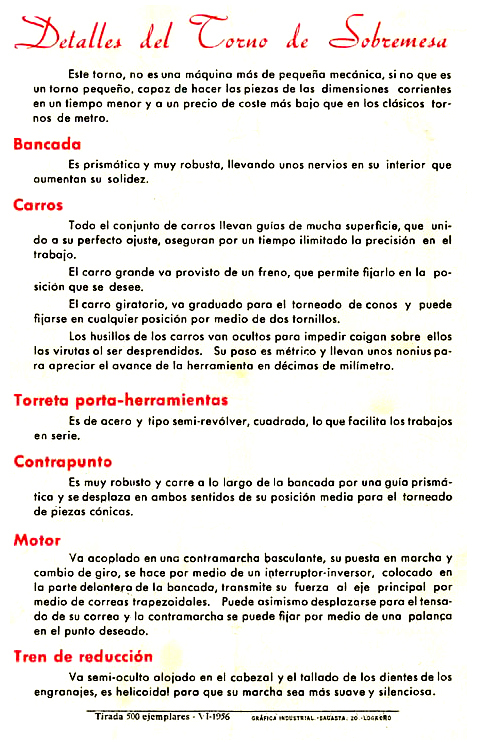 The only known surviving catalogue is for a 1956 Model 600-A - being dated 1956, this showing that two types of V and flat-way bed were supplied, presumably one earlier and one later. The former was conventional with its guiding Vees symmetrical and the latter - as used on the 600A - being 160 mm wide and having its front V set with a wide, shallow-angle outer surface (to better absorb wear) and the inner set much more steeply to take thrust. Backgeared, the headstock had taper bronze bearings, these being adjustable for clearance by castellated rings at each end. 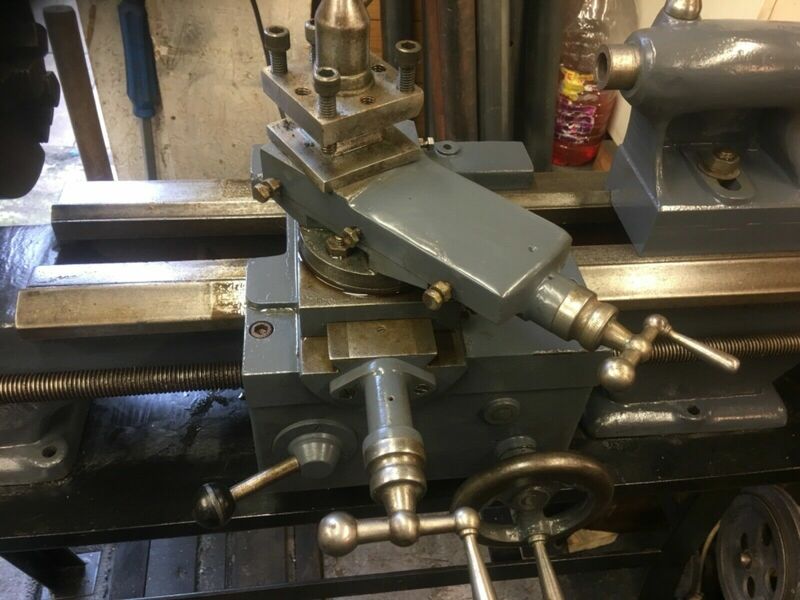 Backgear, at a ratio of 5:1, was fitted, early lathes having ordinary spur gears while later types used a quieter-running bevel type, the increased end thrust that resulted having to be absorbed by changes to the bearing set-up. Bored through to clear 20 mm, the spindle on the 600-A had a No. 3 Morse taper nose and a thread believed to have been 1.5" x 8 t.p.i., the use of a Whitworth form in a metric country being not uncommon in that size. Spindle drive was by a V-belt running over a 4-step cone pulley, the heavily-built countershaft being mounted separately behind the headstock. Supplied as standard with a 1/2 h.p. motor, the initial drive was over 2-step pulleys that gave a total of eight speeds in direct drive and eight more in backgear. While the standard speed range ran from 102 r.p.m. in backgear to a rather slow top speed of 514 r.p.m. in direct drive, as an option, a high-speed range could be specified, this giving a range from 60 to 142 r.p.m in backgear and a high in direct drive of 302 to 720 r.p.m. - rather better, but still not ideal for the size of machine where 40 to 1250 r.p.m. would have been so much more useful. 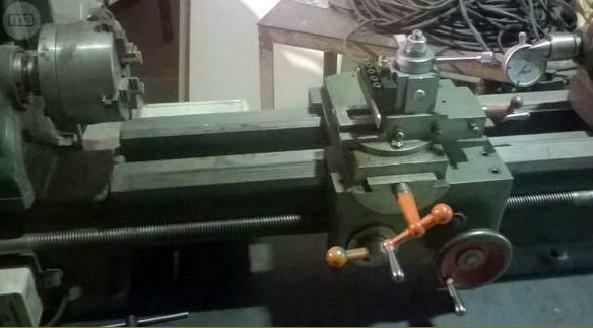 Screwcutting was by changewheels, a set of sixteen being provided that included a 127 gear to generate Whitworth threads. 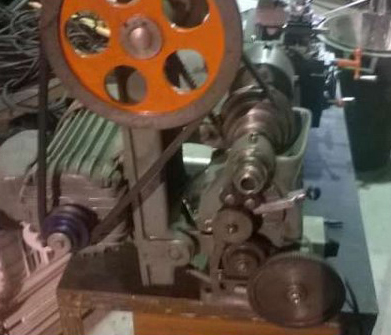 The drive passed through a conventional tumble-reverse mechanism to a leadscrew believed to have had a pitch of 3 mm. 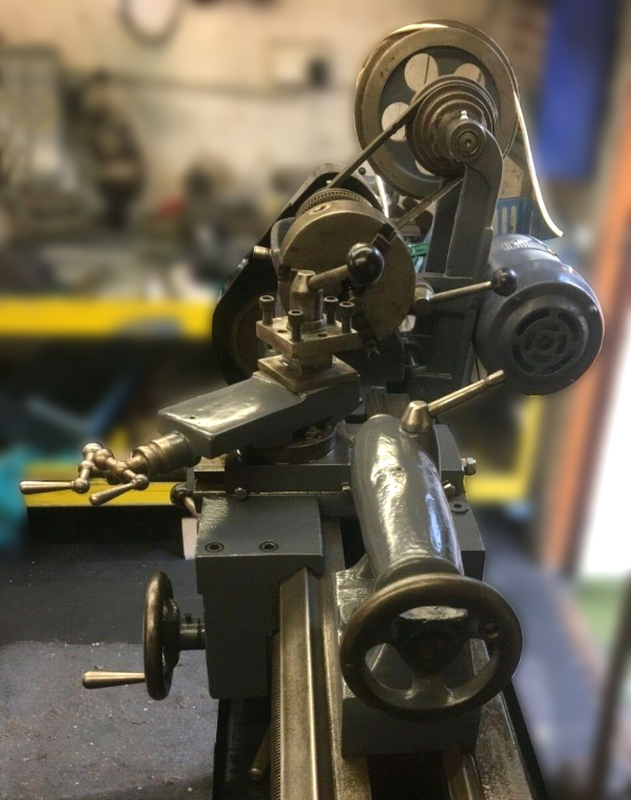 Both power cross-feed and hand cross-feed models were offered, the former fitted with an apron holding a worm gear through which passed the leadscrew - the gear being turned by a key that ran in a slot machined down the length of the screw. A thread-dial indicator was part of the standard equipment and mounted on the left-hand face of the apron. 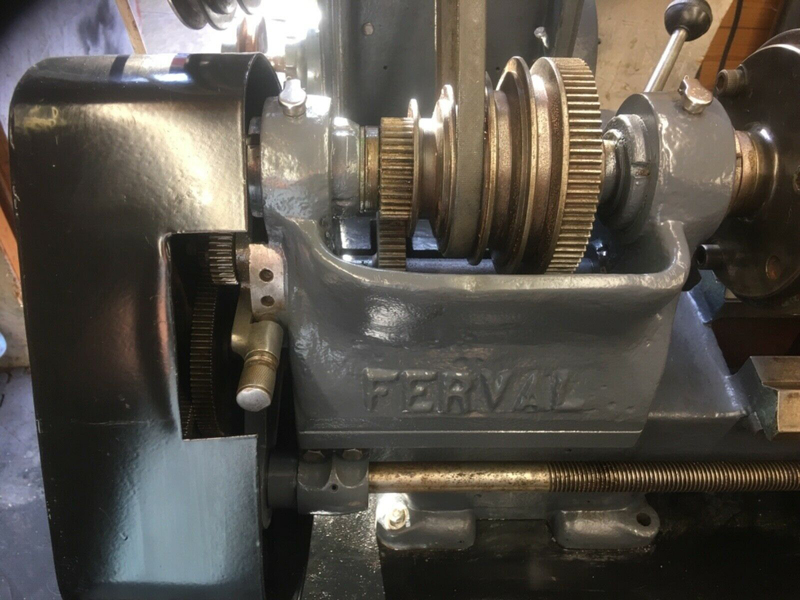 Selection of sliding and surfacing feeds was by a three-position quadrant lever, the drive being engaged immediately in the two outer positions as no clutch was fitted. 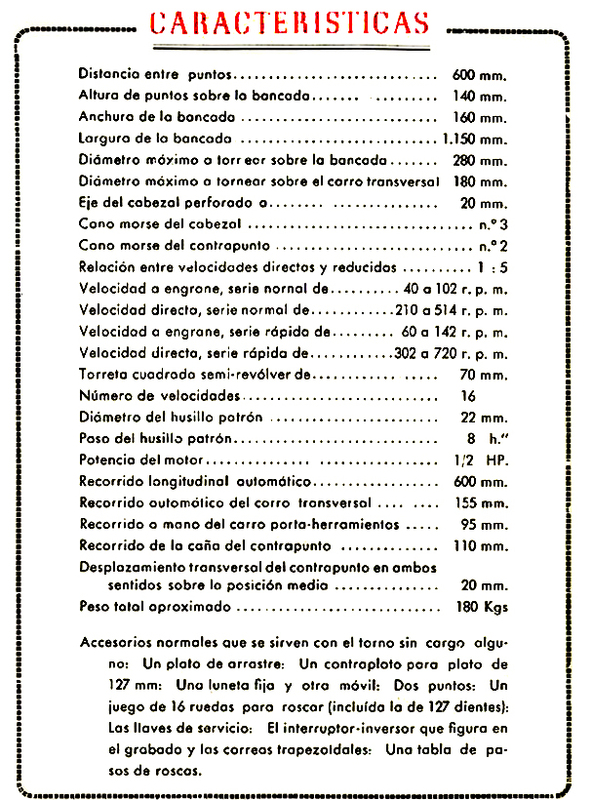 Under power, the longitudinal travel was 600 mm and in traverse a useful 155 mm. However, this inexpensive arrangement posed the danger of the drive - when using a deep cut - of "winding up" and so being next to impossible to release. The top slide, fitted as standard with a 4-way toolpost on the 600-A, had a travel of 100 mm - though, as a miserable, penny-pinching arrangement, only three gib-strip adjustment screws were fitted. Fitted with a screw-feed spindle having a No. 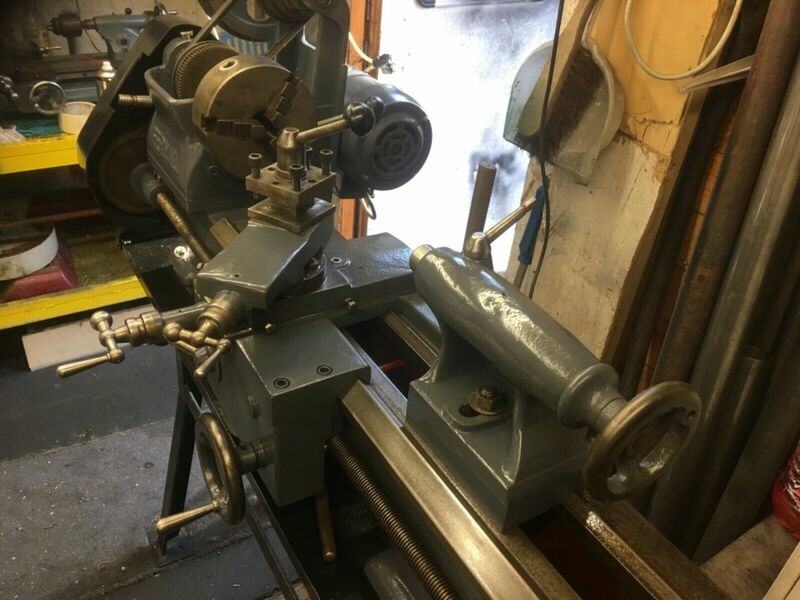 2 Morse taper and a travel of 150 mm, the tailstock could be set over on its base plate by 20 mm for the turning of slight tapers. 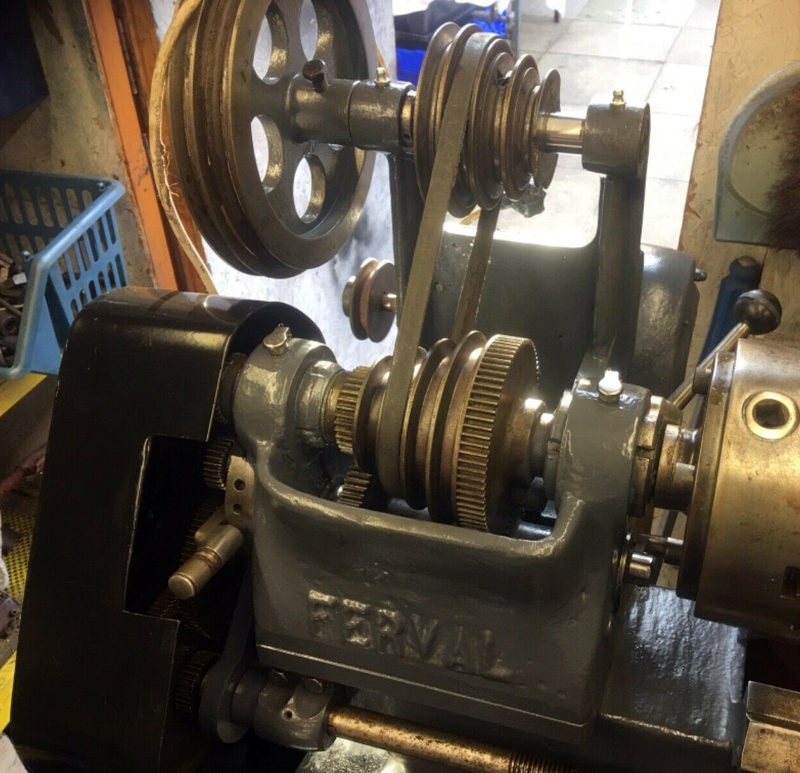 Supplied as part of the standard equipment on a 600-A was a 4-way toolpost, fixed steady, travelling steady, a set of 16 changewheels including a 127t transposing gear, a 1/2 h.p. 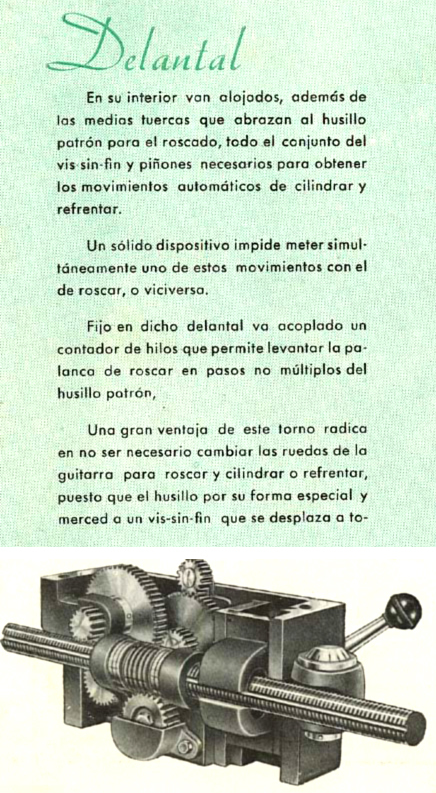 electric motor with a built-in reversing switch, the necessary spanners, drive belts, instruction book and screwcutting charts. 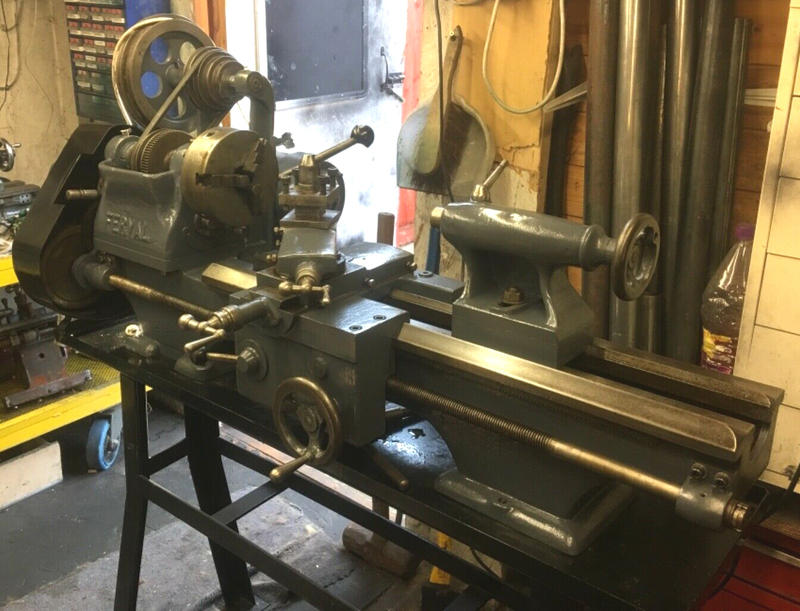 The lathe weighed approximately 180 kg. 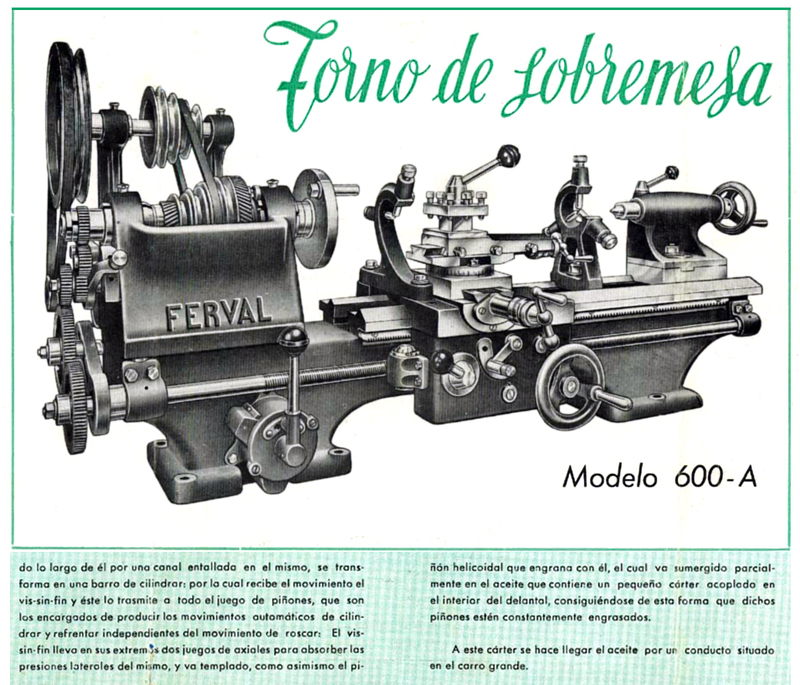 If you have a lathe (or other machine-tool) made by Ferval, please do contact the writer, he would like to extend this section of the Archive. 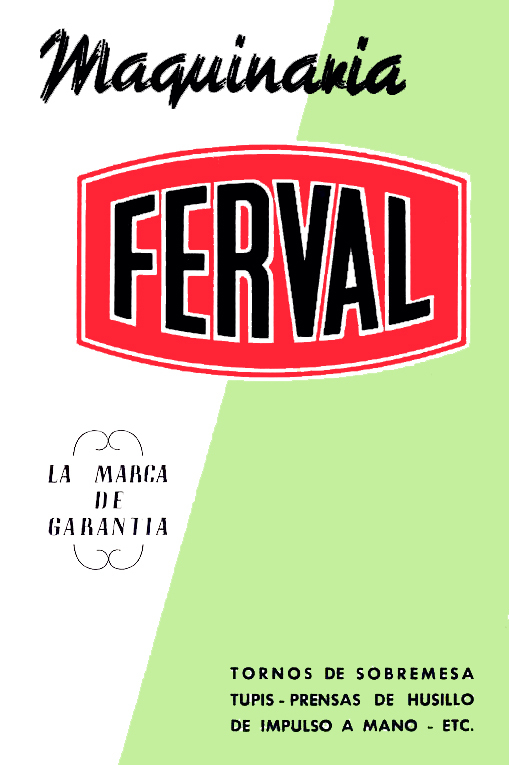 Si tiene un torno (u otra máquina-herramienta) fabricado por Ferval, contáctese con el escritor..